these days i felt burning. since Tuesday morning i was asked to care my baby in the morning, baby cried several times severely for his mother while she attending her school, i just too sleepy and felt right to let baby know his mother can't care him all way like before, so i just let him cry miserably. he slept once in the mid and when he asked for my care i just replied boy should find ways to play on his own. later he asked to talk with his mother so i held him to phone but three times his mother was absent. when his mother returned she held him outside immediately. next day baby got heat in his body and worried his mother seriously. she massage with alcohol but don't work. then she bought him some medicines. last noon she finally decided to bring him to hospital. after returned his mother didn't tell me how he was treated. while in these day i again sensed the situation i was encompassed before i fell into asylum last time. i saw God's set let people around me mentally against me in office and partially at home. i here God's call that the idea and thoughts dwelt on me when i was trapped in asylum was truth and all my actions abnormally in those turbulent moment was in right thoughtful mind and i should proud of them. the shortage of attention against adversities distressed me and i in urgency to talk. then i found a guy of my home town who now studying painting in Qinghai Prov., northwest of China, and talked to him in a style almost monologue. then i posted my monologue onto my blogs. after last night sleep this morning i felt much better and i picked down-loading of games as usual. at noon i got know my baby yesterday got enema treated and in addition of injection on his hand. baby called injection on his bottom. i know God's seeing all these, including darks and shadow over half sky. i cared baby's sleeping at noon. 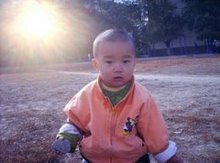 after he woke up i told him my devotion to God and my choice to follow God's guide, in a sole aim to build my site and sight of new China in new Millennium. baby in voice and listened my appeal. how i cherished these moment. after returned to office i got a interview with a guy also from Hubei Prov., my home town province. he likely just punished from wrong doing, even he just a tiny fish in the mud water, for he was removed from previous lucrative job and now an administrator of the dorm of QRRS, where i gradually burned out my calmness and walked to pure God's call and later brought to my home town and treated there last year. i know enemy of my task, the evil, was gathering and threatening me step by step. God shines over the land i stand. i know my site was on the aid of my latest beloved girl. i know i m resourceful. i know i own all what i need to finish my task from Heaven here. i do and do in my choice of God. ps: i caught a storm on way home, even it rightly started before i left the office. it just beaming again as soon as i got my home and see my baby. i caught wet all the shirt.